The large and rustic living room of this log cabin is where I hold my bluegrass music classes. Of course, a log cabin makes the ideal setting to teach classes in old-time and bluegrass music. I joke with my students that they only have to breath deeply inside the cabin and they’ll soon be able to play any old-time or bluegrass song they want. In the photo above you can see my student band, which is called the Log Cabin Band. (What else?) This past fall I took this group of intermediate students busking out on the streets of downtown Asheville. We actually made over $100 in tips which went into a fund for a youth scholarship so a young person could get a jump start in learning the banjo, fiddle or mandolin. Our other log cabin is a rustic and totally authentic 1880’s hand hewn log cabin made of huge poplar logs. This cabin is located in a secluded hollow in a remote and mountainous part of Madison county about an hour northwest of Asheville, North Carolina. Totally off the grid, we rely on kerosine lanterns and candles to light our way. As you can see, it has a great front porch with killer views of the surrounding mountains. For almost a hundred years, this porch has witnessed some great old-time music. In the 1930s Effie Worley and her brother Dewey often sat on that porch and played and sang songs by the Carter Family and Jimmy Rogers, to name just a few. The photo of Effie and Dewey Price was taken as they performed on WWNC radio in the early ’40s. Recently, the old log front steps started to deteriorate. Last November I replaced one of the bottom steps with one huge rock, which I managed to move about two hundred and fifty yards using only a come-along and brute strength. Not able to find any more rocks of that size, I decided to hew out new steps from a gigantic red oak tree that the wind brought down in the back yard of our home in Asheville. It’s been quite an adventure to use a broad axe and chain saw to rough out the logs to make the steps. First I cut the log to length, and then using wedges, managed to split the logs in half. By the way, this is the technique that was used to make what were called puncheon floors. It meant that after splitting the logs, you turn the flat side up, to make a flat but rough service for your floor. There’s actually an old-time tune called “Puncheon Floor” that I recorded on my album called Log Cabin Songs. After splitting the logs lengthwise, I plan to trim off the round side using both a chain saw and a large hewing axe. To get in the mood for hewing the logs flat, I started to sing the old song “Little Log Cabin in the Lane” that was written in 1870 by William S. Hayes. His considerable songwriting skills got him thrown in jail during the Civil War after he wrote a “seditious” song critical of President Lincoln. Hayes’ more benign compositions included well-known songs like “Jimmy Brown the Paper Boy,” “Molly Darling,” and “I’ll Remember You in My Prayers.” I had the pleasure of recording “Little Log Cabin in the Lane” on my Log Cabin Songs CD. 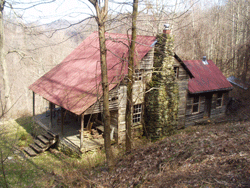 You can find more history and the musical notation to “Little Log Cabin in the Lane” in my book Log Cabin Pioneers. While their spirits now are roaming with the blessed. In that little old log cabin in the lane.